If you have read an earlier post of mine, you would know that I am a big fan of playing the goalie out as far as possible. When the ball is in the offensive third of the field, I have no problem with the goalie being at the edge of the kick-off circle. Besides making the goalie feel more a part of the team and of the action, playing the goalie that far out will prevent a number of breakaways on goal, and thus keep the opposition from scoring as many goals. Some of you may recall that when my son was playing in goal, I always told him that I would pay him $100 if an opponent scored from long distance because he was playing too far out. Not once did I come close to paying him $100. But I know his positioning prevented dozens of sure goals from being scored. So you can imagine my concern when I heard that a college player scored a goal on a 95-yard shot. Was the goalie too far out from goal? Had I been coaching him, would I have been out $100? Look for yourself. As it turns out, my $100 would have been safe. It turns out that while the University of Tulsa goalkeeper was standing at the top of the penalty box, he was not playing far enough out. Had he been standing approximately 30-yards from his goal line when Ryan Rosenbaum of Southern Methodist University kicked the ball, he would have been able to easily catch the ball. He would have also been in a better position to stop breakaways if any were to develop. As it turns out, he was caught in no-man’s-land and gave up a needless goal which eventually cost his team the game. As a goalkeeper, don’t be afraid to play up as long as you know the ball can’t be kicked over your head. I am all for involving the goalie as much as possible. In fact based on my previous post (Role of the Goalie) many say I involve the goalie too much. Given the extremes a goalie has to endure, from utter boredom to continuous onslaughts, and the unique pressure they face, goalies do a team a great service so they should be rewarded with more involvement. I also believe that passing the ball back to the goalie is an important strategy. It is a great way to ‘switch the field’ and sometimes a defender has no other choice but to pass it back to the goalie or risk losing the ball. What I’m not a fan of is passing the ball back only to have the goalie kick the ball up-field with no purpose or plan. Yet many coaches promote this exact strategy. However, since there are occasions when a passback is advisable and coaches are going to continue to employ this strategy, at least it should be done correctly. When passing the ball back to the goalie, direction and speed are critical. Unless it is absolutely necessary, a ball should never be passed back that could potentially go into the goal. You never know what can happen. The goalie may slip, the goalie may not be expecting the pass, or the ball may take an awkward bounce. 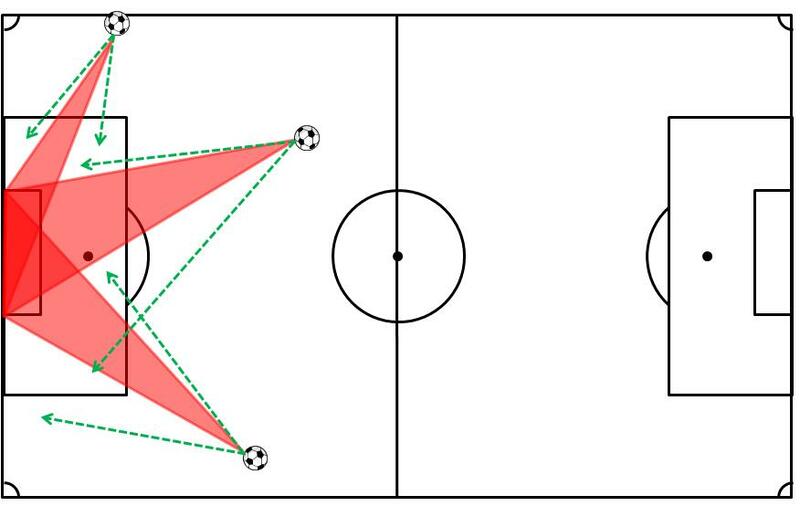 If any of these 3 scenarios should occur a passback will result in a goal (see red-shared area below). The ideal passback should always be passed away from the goal (see the green, dashed lines below). In these cases, a pass will never directly result in a goal for the opposing team. A goalie can help her own cause by pointing and commanding where the ball should be passed. Besides receiving the ball in a good location, this communication confirms that everyone is on the same page. If the goalie does not initiate this communication, the defender making the passback definitely should. Speed is also important. A ball that is passed too hard, especially on goal, is more likely to be misplayed and result in a goal. At the very least, it will result in a corner. However, a ball that is passed too softly is likely to be just as disastrous. An attacking player could reach the ball first leaving only an out-of-position goalie to beat. By all means, involve the goalie as much as possible. Just make sure it is done correctly. I’ve already written about how playing the goalie outside the penalty box will dramatically reduce the number scoring opportunities your opponents will have during a game. Fewer opportunities will reduce the number of goals that are scored. These additional tricks will help out as well. On free kicks, a goalie should position herself on the goal line or better yet, one foot inside the goal line. In youth games, goals are often scored on free kicks by kicking the ball over the goalie’s head. By standing on or inside the goal, chances of this occurring are reduced. In addition, it is much easier for a goalkeeper to run forward to meet a ball than running backwards. Shooters have a tendency to kick the ball right in the middle of the goal. Therefore, if the goalie is positioned correctly, chances are that a number of the shots will be easily saved. There are several methods to teach good positions that will be covered in future postings. The simplest method is to have your goalkeeper constantly check her position by looking over her shoulders to make sure she is centered between the two goal posts. The next trick may be difficult to grasp and teach but once it is learned, it will become second nature. First of all, a goalie needs to learn to anticipate a shot on goal. Once the kicker’s head goes down to look at the ball, the shot is not far behind. Then just before the ball is struck, the goalie should take one hop-step forward and hit the ground with both feet at the same time the kicker strikes the ball. Besides achieving forward momentum, the goalie is now in a better body position to move to her right or left to save the kick. Oftentimes, a goalie is caught flat footed when a shot is taken, making it very difficult to move in either direction. In baseball, you often see infielders and outfielders do the same thing. In addition, the hop step will cut down the angle of the goal. Hockey goalies do a great job of being prepared for a shot and cutting down angles. Once again, playing against a good goalie can make for a long and frustrating day. There a several ways to counter these types of goalie tricks. If the goalie is short and the goals are tall, even if the goalie is standing on the line or in the goal, it is still worth shooting the ball high. Be aware that by playing on the line, the goalie has probably created more space between her and the defenders. In this case, a good strategy may be to drop over the wall but in front of the goalkeeper to an on-rushing attacker. If the goalie has excellent positioning and is cutting the down the angles beautifully, the best thing to do is make one extra pass to a wide-open teammate. This extra pass will require a lot of discipline on the kicker’s part but will almost certainly result in a goal.